A portable scanner - but is there any need for it? 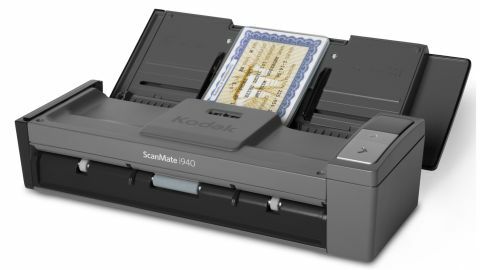 Standalone scanners such as the Kodak ScanMate i940 Scanner are falling out of fashion recently. Some of the decline in popularity can be attributed to all-in-ones, such as the HP Photosmart Plus eAll-in-One, Canon Pixma MG5250 or Kodak's ESP 1.2. The appeal of having one device that not only scans but also prints, faxes and photocopies is undeniable, while improvements to technology have banished concerns over 'jack of all trades' devices that cover all the bases but don't excel in any area. So the Kodak ScanMate i940 Scanner has a task ahead of it to prove itself relevant. Its main selling point is its compact and portable design. While it's handy for those of us who don't have the space for a flatbed scanner in our homes, its main use is for travelling. Just a bit smaller than the already rather compact, and very good, Canon imageFORMULA P-215, the Kodak ScanMate i940 Scanner is light and easy to carry. It can be powered by a single USB connection, although faster scanning times are achieved by connecting the scanner to a power socket or second USB port. Being able to power the scanner via USB makes it even more convenient, without having to root around for a plug socket, but having the option to only use one USB port is a nice choice for those of us already using multiple USB devices. While the Kodak ScanMate i940 Scanner's size is convenient, the installation process and software included was a bit more troublesome, with the software in particular occasionally crashing. We also needed to go online to download the latest drivers from the Kodak website to get it to work properly. When scanning is underway, the noise can be quite distracting, though the fast scan times of around nine seconds at least means the noise didn't last long. The images themselves were very good. Overall this is a flawed device that scans well, and is portable, but is also quite expensive and has some installation issues.